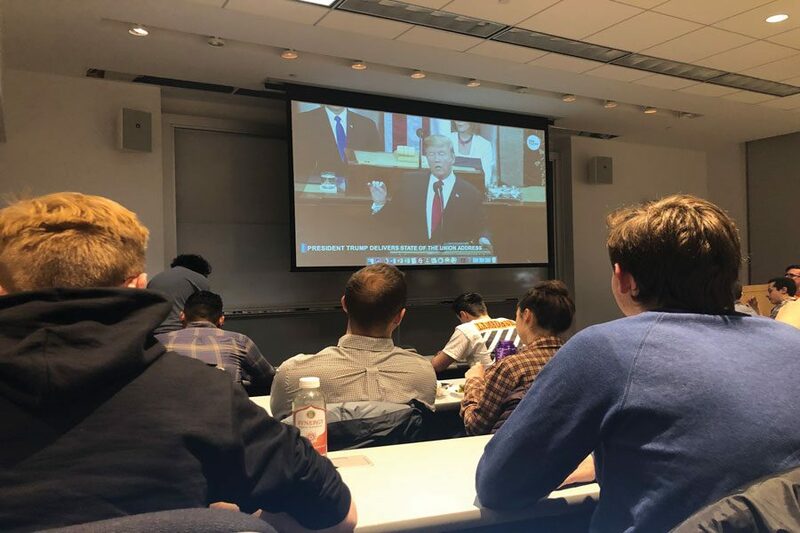 Students who gathered together to watch the State of the Union said they were surprised by the President Donald Trump’s unexpected “presidential-like” speech. As students watched from places like Norris University Center and McCormick Foundation Center, Trump went through his accomplishments from the past year –– which garnered rounds of applause from some and groans from others. Weinberg senior and Democrat Josh Varcie said the president “stuck to the script” as he covered a range of subjects, including immigration policy and the economy. “Just the gravity of the situation combined with the more scripted approach helped him to be more presidential than say, a Make America Great Again Rally,” Varcie said. Although Trump’s speech was more “toned-down” than his other events, Varcie said his rhetoric was still more direct and harsh than that of past presidents, which he finds concerning. Weinberg junior and Republican Dominic Bayer also said Trump’s restrained speech helped him focus on political issues, rather than personally attacking individuals who opposed him. Despite being more predictable, however, Medill junior and Democrat Claire Bugos said Trump’s speech was still politically charged. While she had expected more focus on bipartisanship and unity, she said she was surprised when he made comments against the Mueller investigation. An issue that particularly struck SESP junior and Democrat Linda Sandor during Trump’s speech was his attack on late-term abortions –– he was referring to New York’s new Reproductive Health Act that allows abortions after 24 weeks if the mother’s health is at risk or the fetus is not viable. She said his narrative of abortions being abused to “just kill babies” is inaccurate and that he fails to recognize the complexity behind performing an abortion. “I was frustrated, and it wasn’t exclusive to just the abortion part of the speech, but a lot of falsehoods and stretching of the truth in the speech,” she said. However, Bayer, who agrees with Trump’s stance on late-term abortions, said the president was eloquent while addressing the issue. Rather, he said he disagreed the most on Trump’s negative stance on trade with China, because he said Americans would benefit from China’s cheap products. Despite Trump’s bold statements and promises, Varcie said he doesn’t think much will change in the near future, especially because of the lack of new policies introduced in his speech. He added that the future looks bleak for bipartisan efforts on immigration policies, leading to the likelihood of another government shutdown. For Bugos, the speech was simply a chance for Trump to reaffirm his own policies.